Are you looking for a healthy fundraising alternative? Something from the farm? Something fresh? Farm Fresh Fundraising has exactly that! Fresh fruit from their 1,200 acre farm in Reedley, California delivered to your school or organization. They serve all 50 states! Does the thought of fresh oranges, grapefruit, or lemons get your mouth watering? How about kiwis, persimmons, pomegranates, peaches, nectarines, grapes, or pears? Go ahead and grab a napkin and wipe your mouth, we won’t judge. Then go to their website and see how your group can enjoy these fruits with no upfront cost to you. Sarah and her husband have been a part of the food industry for decades. Let them help you with a healthy fundraiser that’s good for you and your supporters. Valley grown, valley sold. Fresh. Farm. Easy fundraising. Thank you for joining Matt for another great School Zone Podcast episode. Have you heard? 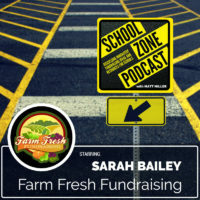 School Zone Podcast released the 2018 Best School Fundraising and Resource Companies Guide. Download this FREE guide and simplify your search for the most innovative companies in the school fundraising and school resource space. Check it out!